In a large flameproof casserole, render the bacon over moderate heat until it is crisp and golden. Use a slotted spoon to transfer the bacon to a plate lined with paper towel. Pour off and discard all but 1 TBS of bacon fat. Add the onion to the pan and cook it 8 to 10 minutes or until it softens. Sprinkle in the flour and stir to incorporate. Stir in the thyme and crushed pepper. Add the clam juice, water, wine, and stir until smooth. Then add the corn and potatoes. Bring to a boil, lower the heat, and simmer the mixture gently for 15 minutes or until the potatoes are cooked through. Stir in the cream and return to a gentle boil. 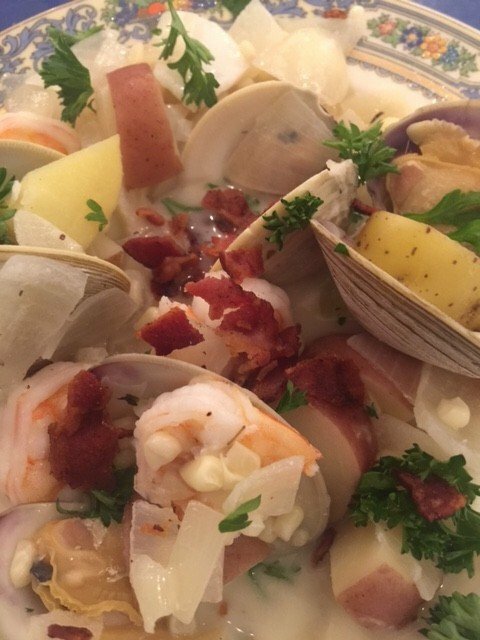 If using raw shrimp, add them now as well as the cod and cook until clams start to open. If using cooked shrimp, add to pot just as clams start to open. Add plenty of salt & pepper. If you like it thicker, mix 1 TBS corn starch in a ¼ cup of cold whipping cream and add to pot and stir. Ladle the chowder in to large bowls. Sprinkle each one with bacon and parsley and serve at once.